Kivy runs on Linux, Windows, OS X, Android, iOS, and Raspberry Pi. You can run the same code on all supported platforms. It can natively use most inputs, protocols and devices including WM_Touch, WM_Pen, Mac OS X Trackpad and Magic Mouse, Mtdev, Linux Kernel HID, TUIO. A multi-touch mouse simulator is included. Kivy is 100% free to use, under an MIT license (starting from 1.7.2) and LGPL 3 for the previous versions. The toolkit is professionally developed, backed and used. You can use it in a commercial product. The framework is stable and has a well documented API, plus a programming guide to help you get started. The graphics engine is built over OpenGL ES 2, using a modern and fast graphics pipeline. The toolkit comes with more than 20 widgets, all highly extensible. Many parts are written in C using Cython, and tested with regression tests. The current version is 1.10.1, released on July 8th, 2018. Read the Changelog. Install using pip, either using the system python (python2.7), or an installed python from 3.5 to 3.7. Install using conda with conda-forge: conda install kivy -c conda-forge. Supports Windows, OSX, and Ubuntu. on OSX and Ubuntu, or ffpyplayer on all platforms. Take a look at our guide toinstallation of the development version. All the screenshots on the website that came from Kivy's examples are under the Public Domain. All the screenshots in the Gallery are from their respective owners. Contact them first if you want to use the content. Kivy is a community project, led by professional software developers. We are responsible for developing and supporting Kivy, alongside of the community. We also work for companies that use Kivy for their professional products. He became a programming expert from working in IT for years before starting with Kivy. He's French, and founded Melting Rocks. He is an Information Systems engineer and working at Tangible Display, an NUI/innovative interactions company. He lives in France. He is a freelance developer. He is from India. He is an independent game developer who is very interested in creating game development tools for Android. He lives in Utah. He is a postdoc in physics, with a little time to make fun graphical interfaces. He lives in the UK. He is a developer using Kivy with Python to automate scientific research. He lives in the eastern USA. Richard is an educational software developer (B.Sc, Hons) from South Africa. He likes being silly, meditating, music and hugging fluffy things. On IRC, he's ZenCODE. He is an independent developer from the Carpathian wilderness. On IRC, he's thopiekar, but you should prefer contacting him by mail. He is a hobby coder, bookworm and pianist, who fancies portability and simplicity. He lives in Eastern Slovakia. Linux geek and open source addict, he works as a software architect and lives in Spain. Mark Hembrow, who was one of our first sponsor, by giving us a Mac Mini. 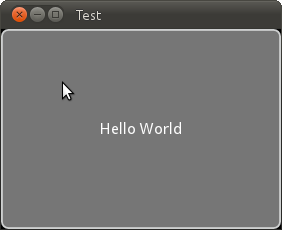 Which was used for all the build system: unit test on Windows / OS X and Ubuntu + building the HTML and PDF documentation. Vincent Autin for his work as a designer for the project, specially on the logo. Many people have contributed to Kivy and we're always interested in growing our community. If you want to help in terms of writing code, improving documentation, testing, etc. or simply making a donation, please do not hesitate to contact us. GrDevDay 2013 in Grad Rapids, MI, USA. EuroPython 2012 in Florence, Italia.